The southern Wisconsin snow drought finally came to an end this week with two snowstorms moving through over the weekend and again midweek. Almost the entire state is now snow covered, with the exception of one area in the northwest, with snow depths ranging generally from 6 to 12 or more inches. The new snow finally allowed some southern counties to open snowmobile trails and improved conditions in northern counties on the Wisconsin Department of Tourism's Snow Conditions Report (exit DNR). Trails through most of the central portion of the state remain closed. Cross-country ski trails were being groomed at many state parks and forests across the state and ski trail conditions ranged from excellent to fair depending on the location. A reminder that with cross-country ski trails snow-covered and groomed they closed to hikers and snowshoers. Check park maps for trails open to foot travel. Despite the arrival of colder temperatures inland ice conditions are still variable with areas of thin ice still being reported. Angler are fishing for walleye, crappies, perch and northern pike on northern lakes. Panfish anglers continue to have success on many of the backwaters of the Wolf River system and there have been some good reports of decent walleye catches. Slow fishing is pretty much the report from everywhere on the West Shore of Green Bay. Anglers are not venturing too far out yet with the shifting ice and cracks forming. Anglers fishing the Fox River out of Voyageurs report catching decent numbers of walleye through the ice. Along the East Shore ice depths ranged from 6 to 22 inches with some large ice shoves still reported at many locations. Most anglers were fishing for whitefish or perch but very little action was reported. With the new snow there is lots of evidence of fox and coyote out there, as well as turkey leaving tracks. With little snow covering in central Wisconsin, rabbit hunters have enjoyed good success. The snow is not too deep and hunters and dogs can move about easily. While much of Wisconsin finally has enough snow for skiing and snowshoeing, the frigid temperatures in the forecast have caused the cancellation of candlelight events this weekend at the Red Cedar State Trail Friday night and Brunet Island, Hartman Creek and Whitefish Dunes state parks and Point Beach and Lapham Peak state forests Saturday night. Candlelight events are still scheduled Saturday at Stower Seven Lakes State Trail and the MECCA Trails at the Turtle-Flambeau Scenic Waters Area. To check for events and cancellations search the DNR website for "Get Outdoors." The snow events increased bird activity at many backyard feeders this week, particularly across the south, among them being cardinals, house finches, juncos, and various other seed-loving species. Woodpeckers are front-and-center at feeding stations with nuts, suet, and other fatty foods, including downy, hairy, red-bellied, and pileated woodpeckers. A flock of 800-plus Bohemian waxwings in Bayfield County was reflective of their continued influx into the northern third state. Several snow events increased bird activity at many backyard feeders this week, particularly across southern Wisconsin, among them being cardinals, house finches, juncos, and various other seed-loving species. Woodpeckers are front-and-center at feeding stations with nuts, suet, and other fatty foods. Amid the regular downy, hairy, red-bellied, and pileated woodpeckers, birders also reported some yellow-bellied sapsuckers, northern flickers, and red-headed woodpeckers as far north as Green Bay. The snow cover also pushed ground-feeding field birds to plowed roadsides in search of more accessible foods, including sparrows, Lapland longspurs, horned larks, and snow buntings. Particularly impressive this week were counts of 220-plus American tree sparrows in Green County and 400-plus Lapland longspurs in Dodge. Some other impressive single-day counts included 32 European goldfinches in Kenosha, 225 trumpeter swans in Polk, and 10 golden eagles in Buffalo. A flock of 800-plus Bohemian waxwings in Bayfield County was reflective of their continued influx into the northern third state. Pine grosbeaks have become especially prevalent there also, especially in towns where crabapples and their favored boxelder seeds occur. I was fortunate to find 120 in Bayfield on Jan 20, including 25 in a single crabapple tree! 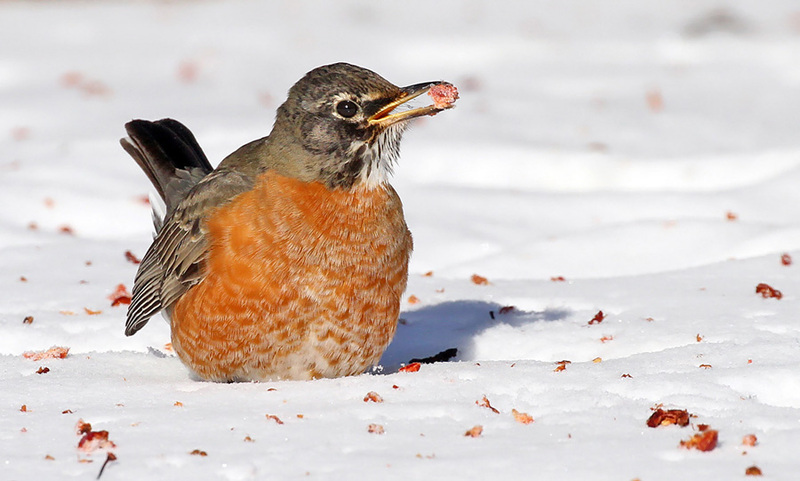 American robins, which also turn to fruit to survive the winter months here, are showing in small numbers statewide. While much of Wisconsin finally has enough snow for skiing and snowshoeing, the frigid temperatures in the forecast have caused the cancellation of candlelight events this weekend at the Red Cedar State Trail Friday night and Brunet Island, Hartman Creek and Whitefish Dunes state parks and Point Beach and of Lapham Peak state forests Saturday night. Candlelight events are still scheduled Saturday at the Lapham Peak Unit of the Kettle Moraine State Forest (parking voucher required), Stower Seven Lakes State Trail and the MECCA Trails at the Turtle-Flambeau Scenic Waters Area. While many hardy Wisconsinites are probably willing to brave an hour or two of freezing temps to ski or snowshoe, we rely on volunteers from our friends groups to put on most of these events. From setting out luminaries, to making and serving hot chocolate, to cleaning up afterwards they may put in five to six or more hours, and that's a bit much for us to ask of our reliable volunteers in subzero weather. There are still plenty of other opportunities to get out and enjoy state properties this weekend. Daytime snowshoe hikes will be held at Peninsula, Willow River and Kettle Moraine South and Richard Bong is holding a cross-country ski clinic. Jan 26, 9 a.m.-noon: Sugar River Wetlands - Help cut invasive shrubs and use brush to block unauthorized trails in and around East Bluff SNA at Devils Lake State Park. Take in some of the most breathtaking views Wisconsin has to offer and help protect some of the most uncommon species and natural communities in the Midwest. If the trails are not snowy/icy we'll be concentrating work efforts around the prairie and the Devils Doorway trail segment. This will be the first of a series of monthly stewardship activities sponsored by Ben Bomkamp and Kerstyn Perrett of NatureWorks llc through 2019, who are hoping to help build enthusiasm and understanding of the role that we can all be playing to protect our state's most treasured and irreplaceable resources. Jan 25, 9 a.m.-noon: East Bluff Devils Lake - Help the Upper Sugar River Watershed Association (USRWA) restore the Sugar River Wetlands State Natural Area during our series of "4th Saturdays" winter volunteer work days. Volunteers will be cutting and burning invasive species like buckthorn, honeysuckle and more to promote the growth of native plant species. It promises to be rewarding, fun, and a great way to experience the outdoors during the winter. Refreshments including hot chocolate and coffee will be available to fuel you through the morning. Slow fishing is pretty much the report from everywhere on the West Shore of Green Bay. Peninsula State Park - Some cross-country ski trails been have been groomed (corduroy/levelled) but were not tracked on, Jan. 24 and ranged from fair to good condition. Other trails have not been groomed. Kettle Moraine State Forest - Lapham Peak Unit - Lapham Peak received 4 inches of dry snow overnight Friday into Saturday and more on Tuesday into Wednesday. All the trails were groomed. Off the man-made loop conditions are not as good. The snow packs down to a thin base and no track will be set. Lights will be on the entire lighted course until 9 p.m. Monday through Saturday. No lights Sunday night. Governor Dodge State Park - Cross-country ski trails were groomed and packed (rolled/compacted) on Jan. 23. Trails were packed but not tracked. Snow base is 3-5 inches.